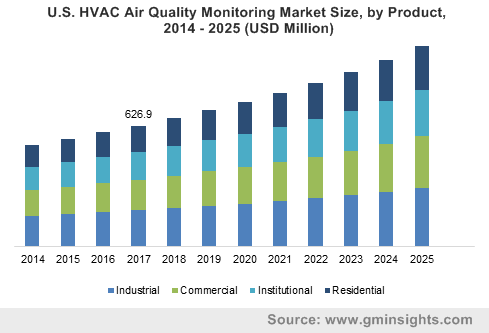 Canada HVAC Air Quality Monitoring Market « Global Market Insights, Inc. The HVAC air quality monitoring market has lately been the recipient of robust growth as the awareness about the importance of maintaining healthy indoor air quality has gained widespread recognition in the maintenance of general human health. As per the World Health Organization (WHO), every year 8 million people die worldwide due to poor air quality. Remarkably, the number is greater than people killed by tuberculosis, AIDS and malaria combined. A major percentage of those deaths occur in low and middle-income countries, where facilities to monitor the quality of air is typically limited. For instance in India and China, where urbanization has been developing at a pace almost unmatched by anywhere else on the planet, the air is often heavy with smog. The threat of air pollution in China is so severe that in Beijing recently an urgent alert has been sounded which advised children and the elderly to remain indoors. This has made it imperative that the indoor air quality should be maintained at safe levels and HVAC air quality monitoring market, in this context, has gained major impetus. International agencies are also coming up with new devices to measure the air quality as the number of deaths and disability caused by air pollution becomes alarming. For instance, in 2015, UN Environment launched a device for air quality measurement, that was ground-breaking and affordable at the same time. Being significantly less expensive than the mainstream solutions, the device is expected to revolutionize air quality measurement across the developing world. The device can measure the concentration of particulate matter besides concentration of Sulphur and nitrogen oxides. As it comes with a GPS tracker, it can pinpoint the source of the pollution. Increasing awareness about the dangers caused by poor indoor air quality has imparted a significant boost to the HVAC air quality monitoring market as most of the times, especially in urban areas, people remain indoors. In air-conditioned buildings, a potent HVAC system has become a compulsory feature, especially in the face of tightening regulations that have made energy efficiency in buildings a mandate. A device that had taken the HVAC air quality monitoring market by storm when it was first launched was Speck 2.0 which was developed by a Carnegie Mellon University spinoff called Airviz Inc. The device could be easily installed in homes and constantly displays air particulate matter that helps residents to adjust indoor activities or air ventilation to bring down particulate matter to safe levels. According to the WHO 4 million deaths are caused worldwide by poor indoor air quality conditions that is often caused by simply cooking on the stove or lighting a fire with improper ventilation and can lead to serious disabilities like asthma, autism and ADHD. Commercial property owners have shown interest in learning what can put residents and customers in danger and the ability of modern devices to unveil risk factors in indoor air quality has brought greater demand in the market for HVAC installers. Air quality reports can encourage brand loyalty and recommend HVAC systems if consumers enjoy clean air. The rise of air-influenced maladies along with increasing number of tech savvy consumers has pointed out to all HVAC companies that they need to need to join the air monitoring bandwagon sooner as soon as possible to remain competitive in a fast-evolving market. Including IAQ and OAQ monitoring on all units would make it possible for businesses to get ahead of the curve and the competition in the HVAC air quality monitoring market, by not only offering peace of mind for businesses and but also by taking steps to decrease the environmental impact of existing units. This entry was posted in HVAC and Construction and tagged APAC HVAC Air Quality Monitoring Market, Canada HVAC Air Quality Monitoring Market, Europe HVAC Air Quality Monitoring Market, Germany HVAC Air Quality Monitoring Market, Global HVAC Air Quality Monitoring Market, HVAC Air Quality Monitoring Industry, HVAC Air Quality Monitoring Market, HVAC Air Quality Monitoring Market 2019, HVAC Air Quality Monitoring Market 2025, HVAC Air Quality Monitoring Market growth, HVAC Air Quality Monitoring Market share, HVAC Air Quality Monitoring Market size, HVAC Air Quality Monitoring Market statistics, HVAC Air Quality Monitoring Market trends, HVAC Air Quality Monitoring System Market, hvac indoor air quality monitoring, HVAC industry analysis, MEA HVAC Air Quality Monitoring Market, quality air hvac, U.S. HVAC Air Quality Monitoring Market.